An unusual white horse has been wandering around in Greendale Forest. Maybe he needs some help? This horse might have a tale to tell. I recognize a true Soul Rider when I see one, and you are one most definitely. I can sense it a long way off. So your name is Rita? A pleasure to meet you. You know Alex and Linda as well? That’s absolutely brilliant! But I take it you haven’t met Lisa? I thought not. Prrfffff… Yes, it’s true that Lisa is gone. As I said, I am Starshine, and Lisa is my Soul Rider. But she’s lost, and I fear the worst… Sniff. After a long time away from Jorvik, when Lisa traveled around the world playing her… Um… Electrical lute, or whatever it’s called, and for payment howled loudly in front of hysterical audiences and other nonsense, the day I’d been longing for finally arrived. The day my beloved Lisa returned to Jorvik Stables. Straight over the moors we ran. The wind was roaring and whirling through my mane, messing up Lisa’s fiery red hair. Matching the howl of the winds of spring, we bellowed in pure joy, and the delight of seeing one another knew no boundaries. Lisa whispered a promise that we’d never part again. She said she would remain on Jorvik, and I thought I’d never let her leave me again. But I didn’t say so at the time. We galloped and galloped over the plains. We rode long and aimlessly, just enjoying the wild run. Freedom. Neeeiigh! The afternoon came, and that’s when my memory starts to fail me. Something horrible happened during the ride, but I cannot remember what it was or how it happened. My only recollection is a sharp, sudden ray of light and a strange sound. Then everything went black. I think I must have passed out. When I came around, I was woozy and unable to orientate. Night had fallen. It had started to rain, and thunder was rumbling in the distance. Perhaps the rain woke me. Or maybe the cold. But the worst part was that I couldn’t sense Lisa’s presence any more. Objectives: Listen to Starshine’s tale. There is more to Starshine’s story of woe. My despair is endless. I have spent many long weeks in search for my beloved Lisa. I’ve looked all over. Right now I’m searching beneath every leaf in the Greendale Forest, but soon I won’t have anywhere else to look. Sniff. My heart is heavy with grief. Oh? You’re saying you’ve received reliable indications that Lisa’s been rendered defenseless and hidden in the Grey Mountains? Interesting… Very interesting. I have a partial memory of having taken a trip to the northern part of the mountain. It might be so. I have looked there without finding anything, but maybe I haven’t looked close enough. Will you help me look for Lisa and follow up on your new clues? Objectives: Will you help Starshine? Or she’s gone. Sniff. But your new information gives me renewed hope that we can find her. At least I hope we can find a clue. One, tiny indication on what has befallen her. We’ll search through the northern range of the Grey Mountains. On your map, I’ve marked some interesting places to look. I know certain locations will be a bit tricky to find, Lisa and I rode all over the place. Let’s meet in the area after we’ve performed the search. I’ll be looking in some of the more hard-to-find locations. You’ll be able to see me on your map, so it won’t be a problem finding me in the area later, when we’re due to report our findings. Good luck Rita, my friend. Now let’s find Lisa! Objectives: Search the places marked down on the map. Afterwards, report to Starshine, who also is looking nearby. The location you need to search to complete the quest is off of Dew Mountain Road. Coming from the south, turn off the road to the left at the bottom of the first big hill (if you get to the bridge, you’ve gone too far), and go up the small hill to cliffside and branches piled on the side of cliff. 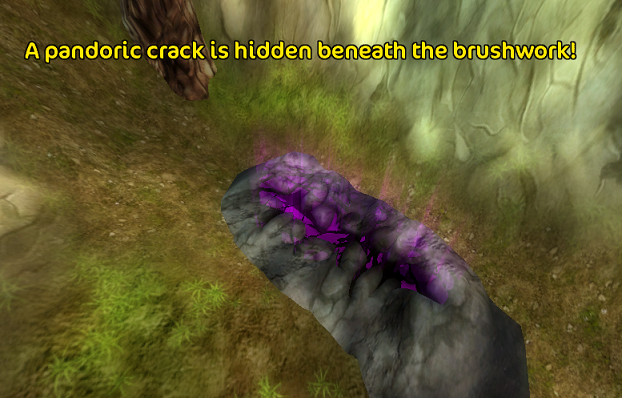 When you search the branches, you will uncover a strange silhouette that has been burned into the rock. Objectives: Locate Starshine and tell him what you’ve discovered. You’ll find Starshine nearby. Starshine can be found wandering around across the road. He is also noted as a green dot on your minimap. A blackened mountain wall? A spot that’s been burned by unnatural fire? Old tracks? Very interesting! Prrfffff-neigh! Show me where it is! Let’s go to this strange spot you’ve found. Objectives: Ride the nearest way to the strange spot with the charred mountain wall. Follow Starshine back to the silhouette. So you’re saying it was the Dark Riders who conducted this cowardly assault and took Lisa? After seeing this, I’m afraid your information is correct. They’ll pay dearly for this. If they’ve harmed as much as a single red hair on her head, I’ll personally see to it that those infernal Dark Riders are sent to the darkest darkness of Eternity! We’ll comb the area for more clues. We’ll turn every grassy knoll upside down until we’ve found something that gives us the answers we seek. Objectives: Look through the area for more clues! When facing the burned wall, turn to the left, and go up the hill to the top of the small cliff. The area you need to search is farther back, in a small ditch surrounded by pine trees. Objectives: Tell Starshine of your latest discovery. Return to Starshine and tell him what you found. 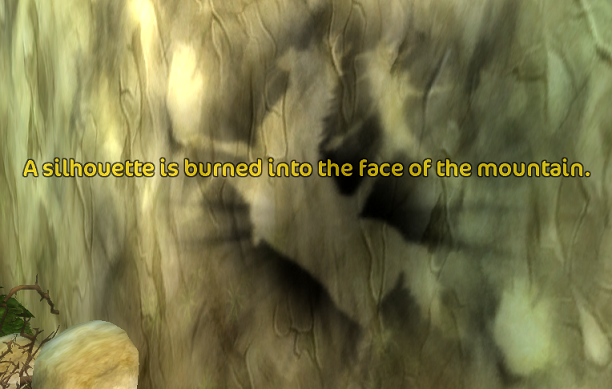 He is wandering around down by the burned silhouette. A hidden Pandoric crack? That sounds alarming. While you were gone, I found tracks of burning hooves in the grass. Dark Riders are behind this, no doubt. Whatever can that crack mean…? Take me to this hidden crack! I have an uneasy feeling in my belly. Nee-eigh! Look! You can easily distinguish drag marks on the ground over there which seem to lead in the direction you say we’re going. Objectives: Take Starshine to the hidden crack. Ride with Starshine up to the hidden crack. Oh, Rita. Sniff. By the lights of Aideen. I think the evil Dark Riders have hidden our beloved Lisa inside the crack. They must have cast some sort of forbidden, black magic and succeeded in sending Lisa to Pandoria! She could be lost forever, captured in a jumble of entangled time and twisted space! Nee-e-eigh! Helloo? Lisa? Are you down there? Can you hear me, Lisa? Objectives: Listen to the dialogue. The scene unfolds before you. …Oooooo… Oooo. o o o O o o o … Oooo… Ooooo…. Lisa! It is I, Starshine! How can we help you? I’m aliiiiiive. Starshiiiiiiine. My daaaaarling Starshine! I’m captured beyond our time and spaaaaaace. Lisa! Lisa! There must be a way to save you! A sleeping widow? Umm… Is someone a bit gone in the head? Ooooo… Wake her! Wake her up! Wake the Sleeping Widow! She’s the only one who can save me. I see you Starshine. I see you… Oooooo… I’m passing into the ages. For you, time is of the essence. For me, it’s everlasting. Yes, Lisa. We will wake the Sleeping Widow. Who is it? And how? Wake! Wake! Wake up the Widow and hep me out. You stay behind, Starshine, and keep the crack open until the Widow has awoken. I won’t leave you here! We’ll wake that… Widow. I promise, Lisa. Lisa! You are gone now, but I will stay with you! Hold out, beloved Lisa! Do not fear Pandoria. You know how to resist it! You can! I know you can! My entire being is torn between despair and hope! We’ve found Lisa, but she may be beyond our rescue. Rita! We need to get her out of there! Now! Whoever that Sleeping Widow is, she must be woken at any cost so she can aid us in rescuing Lisa! We have no idea who the Sleeping Widow is. But you think Linda might know? Ingenious! Ask her! I’m going to stay behind and see to that the crack doesn’t close, while I’m trying to keep contact with Lisa. When and if the Sleeping Widow awakens, and if she actually can release Lisa from the Pandoric prison, I need to be here to help her out. Full speed ahead to the Vineyard! For Lisa! See you later! Objectives: Locate Linda by the Vineyard and see if she knows who the Sleeping Widow is. Ride to the Vineyard. Linda can be found in her usual spot near the stables. Hi, Rita! I’me going out for a ride, want to come with? No? You look like you’re in a hurry. What’s going on? Who is the Sleeping Widow? You and Starshine found Lisa?! That’s incredible! But the bad news is that she needs rescuing from Pandoria, and Lisa says it can only be done by waking a sleeping widow? Ah! “The Sleeping Widow,” she’s talking about a specific individual that goes by that name, I see. No, I don’t know who it might be. I’ll go the Manor’s library and hit the books. Ask the Baroness if she knows something while you wait. You can find me in the library later. I’ll just park Meteor first. Objectives: Ask the Baroness about the Sleeping Widow while Linda looks through the books in the library. Ride over to the front of the Manor and speak with the Baroness there. Good day, Rita! Another lovely day among the grape vines on the plantation, am I right? Does the Baroness Know of the Sleeping Widow? If I know anything about a sleeping widow? No, Rita. I do know of quite many widows, one does so at my respectable age, but none of them strikes me as someone who’s sleeping exceptionally much, and thus have gotten such a nickname. Unfortunately I cannot help you with this matter. You’ll have to trust that Linda finds something in the library books. She might have found something of interest already. Objectives: Speak to Linda in the library. Dismount your horse to enter the library, and speak with Linda there. If the Spy Master can help us? I don’t think so. He does know a lot, but he doesn’t know everything. I think he over-exaggerates his own image somewhat, and cultivates a picture of himself that is way too legendary. Does the Spy Master Know? Why don’t you pay the Spy Master a visit while I look through these books for information? You could ask him if he knows anything about the Sleeping Widow. It’s beyond his field of expertise, so he’s unlikely to know, but if you like and you’ve got nothing else to do, you could always head over there and ask him. It may not yield anything, but no harm could come from it. Take the horse transport. It’s quick and easy. Objectives: Visit the Spy Master in his grotto in the northern mountains and ask him who the Sleeping Widow is. Ride or transport to the Spy Master’s Hideout and speak with him there. I’ve been expecting you. I know why you’re here, but why don’t we make normal conversation out of it anyway and you tell me why you’ve come. The Sleeping Widow. It’s a living being who’s lost its husband. It’s a woman, possibly widowed… And, let me see… Um… She’s also sleeping. She’s also rather unknown. Or maybe “sleeping” pertains to some blindness to the outside world, what do I know? That’s all I can tell, unfortunately? Is it enough? Objectives: Listen to the Spy Master’s response. The Spy Master knows all… Or does he?? No? Hm… I’m sorry Rita, that’s all I can say. However, I’m convince your friend Linda will find the answer in one of the books, if she hasn’t already. Sooner rather than later. And you know what? The right book is always the last one you look through. Objectives: Tell Linda she was right, the Spy Master did not know. Ride or transport back to the Vineyard. Dismount your horse to enter the library, and find Linda inside. I suspected he wouldn’t know anything about the Sleeping Widow. But now you know he doesn’t know everything. He knows a lot though. He has a network of skilled spies which is made up mostly of squirrels. He is very valuable when it comes to certain kinds of information. I’ll keep looking through these books and let you know when I find anything.